The back and forth between these two doesn’t seem to be letting up anytime soon it seems. From break up rumours, to retracted statements to cryptic confirmations and let’s not forget those shocking leaked emails, the ongoing rift between D’Banj and Don Jazzy has had more than enough twists and turns to keep even the most coordinated person in a spell of dizziness. After D’Banj recently gave a much talked about interview, more or less blaming Don Jazzy for the Mo Hits split, many have been looking to the producer extraordinaire to tell his own side of the story. And tell he does. 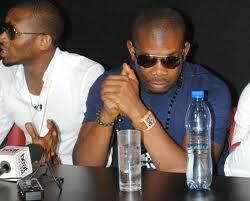 In a new interview, Don Jazzy categorically states that he did not “scatter Mo’ Hits” as D’Banj alleged. He also asserts that he was not responsible for the leaked emails, and goes on to speak on the possibility of working on music with D’Banj. Did you leak the Mo’hits email? Did you ask D’banj that you want to ‘scatter’ Mo’hits? Have you signed any document relinquishing your shares in Koko holding, and giving D’banj his catalogue? When was the last time you saw D’banj? Will you still produce music for him, if he asks or not? Why did you have to get a new apartment? Was D’banj ever told about the concluding part of the Samsung deal? Bros, it’s a tough interview but it’s what our readers (and your fans) want to know. Okay. Have you been producing music during the last few months? And who have you been working with in the studio? Dr SID and Wande Coal have continually shown their love and bond for you over everyone else; how do you feel about their respect for you? Will you start a fresh label in the nearest future or stick with the name Mo’Hits?